Banking stocks soared today on news that the George Osbourne and Mervyn King policy for the Bank of England to give cheap money to the banks to enable them to provide credit to the wider economy. Off course the reason offered is just smoke and mirrors propaganda, the real reason why the Bank of England is yet again stuffing every orifice of the UK Banks with tax payer cash (where ultimate liability lies) is ahead of the high risk of Eurogeddon on Monday following outcome of Sundays Greek election. The propaganda has been swallowed by the mainstream press despite the fact that very similar propaganda has been repeatedly used by the Bank of England for the past 3 years to pump ever more cash into the Bankrupt Banks that to date collectively totals more than £600 billion when taking capital injections, and quantitative easing into account, and what has all that money done for credit to businesses ? Has it increased lending ? So what will today's £140 billion do for lending? NOTHING! Because the money is not for the UK economy but for Britain's bankrupt zombie banks to be kept on life support as a consequence of the counter party losses they will face following a Grexit. At the end of the day the bankrupt banks NEVER pay for their loses, YOU the tax payers are expected to! Meanwhile Labours Ed Balls, came out with even more crackpot statements than usual such as that even more money should be loaned to the bankrupt banks and spent by the government, despite a £120 billion annual budget deficit that remains the last Labour governments lasting legacy. The truth is that today's announcement is part of a co-ordinated global centrals bank panic response in advance of the Greek elections, and will be followed by further similar announcements early next week, so when the dust has settled the Bank of England will have pumped in the region of £250-£300 billion more money into the bankrupt British banks. The bottom line is that the Bank of England is incompetent in that it has FAILED in EVERY PRIMARY Objective set for it from controlling inflation to managing the financial system. At the end of the day printing money no matter by what name it goes is Inflationary, it is what continues to drive Britain's Inflation mega-trend for which the general public will continue to pay a heavy price for bankster crimes whilst senior bank employees continue to bank bonuses on the basis of fictitious tax payer funded profits, which is where much of today's £140 billion will also go, straight into the back pocket of the bankster elite that politicians serve. The credit markets responded to the Euro 100 billion Spanish bank bailout by pushing up the Spain's borrowing costs to Euro-zone record highs of over 7% from 6.5% pre-bailout because they realised that all it will do is to pile more debt onto the backs of Spanish tax payers as well as increasing the actual risk of default because the Euro 100 billion will have no positive economic consequences for Spain, but is purely to keep Spain's ever expanding debt mountain from toppling over i.e. 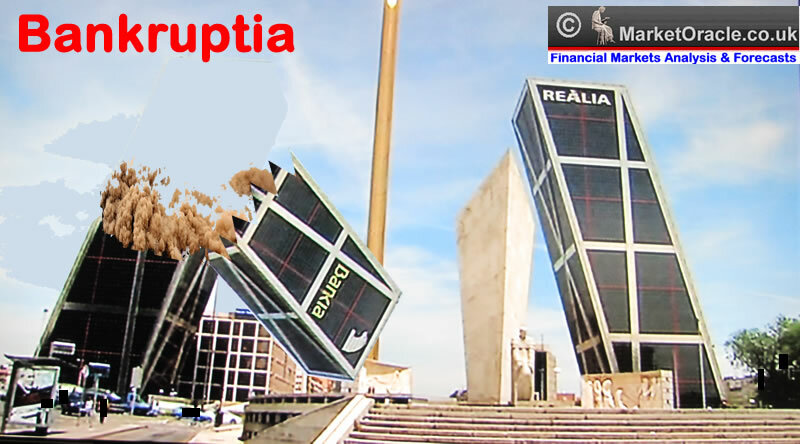 keep Spanish banks liquid whilst insolvent. The bottom line remains, regardless of whatever the politicians state Spain and Portugal WILL leave the euro-zone within 6 months of Greece leaving because of the fundamental flaw in the euro-zone where countries are unable to competitively devalue against one another which ensures ever increasing perpetual austerity. Eurogeddon Will be Good News for the Markets. The mainstream press is fully focused ont he potential dire consequences of Grexit following the Sunday Greek elections. However, as I wrote on the 4th of June at length that eurogeddon would be good news for markets where many of the adverse market trends that had been in force for several months were expected to start reverse ahead of the dissipation of uncertainty which the Greek elections are a clear marker of. Whilst the lead up to Financial Armageddon is resulting in much pain for investors and traders alike. However, my expectation's are for the majority of observed trends to start reversing as the Financial Armageddon uncertainty starts to dissipate, so in a way Financial Armageddon would be GOOD for the markets because markets DISCOUNT THE FUTURE (and the future is INFLATIONARY), and the problem we have in the lead up to the present is that the future has INCREASINGLY been UNCERTAIN. In such a climate of increasing uncertainty, markets increasingly discount even greater FUTURE UNCERTAINTIES in a sort of feed back loop, and hence you have what we have seen in the stock and commodity markets, coupled with the flight of funds into bankrupt money printing nation bonds such as the USA and UK. Therefore No matter what the actual outcome is, and how bad the mainstream press will paint it as, as a total disaster, know this that once future uncertainty starts to dissipate then we will tend to see a reversal in the majority of the trends that have been in force for the past few months, i.e. markets such as stocks, commodities and Euro should rally and markets such as US and UK, bonds, dollar and sterling fall. Now some 11 days on market trend reversals have started to manifest themselves in markets from the stocks, commodities and even all the way to the forex markets where there are clear technical signs of a reversal at work for the Euro against the Dollar. Off course eurogeddon by it's nature will induce market volatility. The big question mark is at what point will the markets react to DISCOUNT future Central bank money printing actions that will inflate asset prices such as the Bank of England's announcement today, so ironically eurogeddon may either only see a very brief negative market reaction or even that the market on Monday moves higher from the outset which will catch many traders exposed to overwhelming doom and gloom off guard. 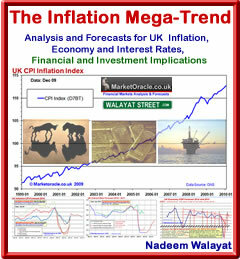 04 Jun 2012 - Euro-zone Galloping Towards Financial Armageddon, Greece Will Take Third World Europe to Inflation Hell! Your analyst checking his remaining Euro notes to make sure the country symbol is X for Germany.